A dramatic romance, Carol is beautifully constructed and superbly acted, but also languid and rather thin in terms of plot and character development. Christmas time, New York City, 1952. Therese Belivet (Rooney Mara) is an aspiring photographer working as a clerk at the lavishly decorated toy section of Frankenberg's, a large department store. 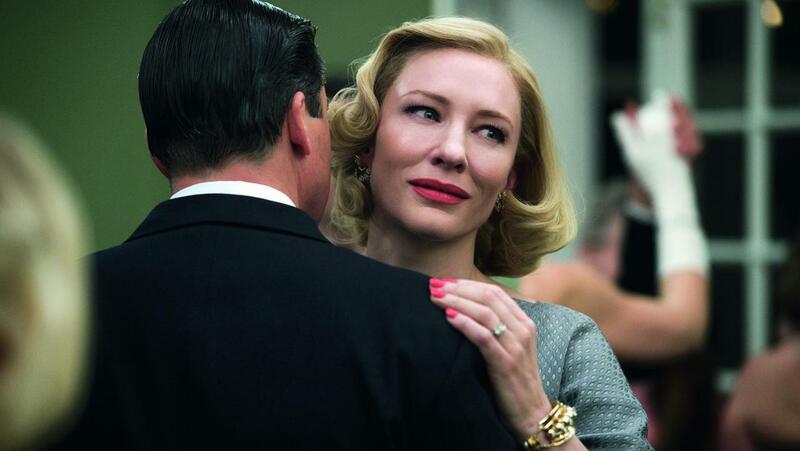 She meets Carol Aird (Cate Blanchett), who is buying a toy train for her daughter Rindy. The two women sense a mutual attraction, and Carol arranges a follow-up lunch, and then invites Therese to an evening at her luxurious home. Therese has a boyfriend Richard (Jake Lacy) and is also fending off the advances of another friend Dannie (John Magaro). Carol is struggling in a failing marriage to Harge (Kyle Chandler), and is still friends with her former lover Abby (Sarah Paulson). When Harge decides that he has had enough and forcibly takes Rindy away from Carol, she invites Therese to join her on an aimless road trip, during which the attraction between the two women will grow and evolve. 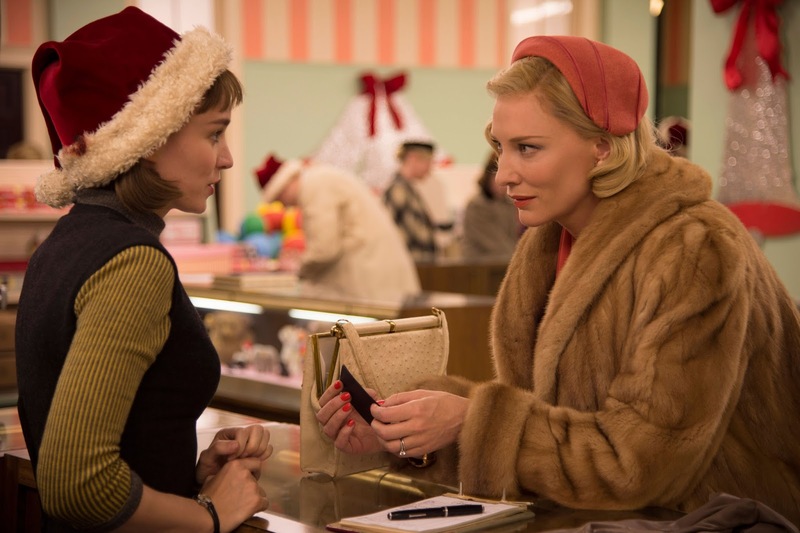 Carol recreates a magical 1950s ambiance, both in a chilly Manhattan decked out for Christmas and on the road where Carol and Therese spend a large portion of the film in and out of second rate motels and nondescript diners. Director Todd Haynes creates rich sets filled with period details, and the film always offers a feast for the eyes. Which is good, because the story of the love affair developing between Carol and Therese unfolds at a most leisurely pace. Based on the groundbreaking 1952 novel The Price of Salt by Patricia Highsmith, Carol's narrative intentions are clear from the opening few scenes, and the film unfolds pretty much as can be expected. And while daring in a 1952 context, the lesbian love story is not original on the screen, with films like 1985's Desert Hearts having explored this territory before. There is not enough plot to occupy the two hours of running time, and Haynes pads the film with ponderous pauses and sometimes painfully slow scenes. The available time could have been deployed to better round the characters. The current emotional conditions of the two women are presented as troubled, with Carol's home life a smoldering wreck and Therese's relationship with Richard suffering from asymmetrical commitment. Little else is offered by way of background, and plenty of potentially flavorful material is only hinted at but otherwise left unexplored, including Therese's family and the story of Abby's past liaison with Carol. Both Rooney Mara and Cate Blanchett deliver perfect performances that make the most of what is known about the two women. Mara brings out Therese's quiet curiosity and a vague sense of unease with what well-meaning but bland men like Richard and Dannie have to offer. Blanchett captures Carol as the jaded, rich woman, growing increasingly tired of conforming to the expectations of the Harges of the world. Visually delightful but slow and starved of depth, Carol is aesthetically satisfying but otherwise emotionally predictable.